Hello, glampers... welcome to 2018! No doubt about it, 2017 certainly was a doozy and some of us were happy to see it go. And there's nothing better than celebrating the new year with a bit of nature therapy. 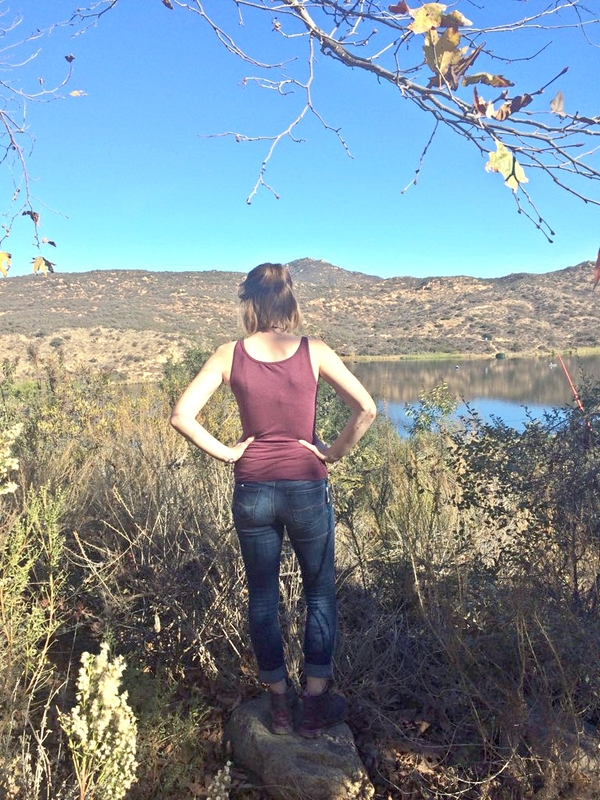 With its convenient location, stunning view, and excellent recreation activities, Dixon Lake was an easy choice for Glamp-Ed's New Year celebration! Dixon Lake is located in Escondido, California, and offers fishing, boating, camping, hiking, picnicking, and hours of rest and relaxation. At $18/night during the off season, it was certainly affordable compared to many other California campgrounds. Dogs are allowed (on leash, of course), and the recreation area offers boats and fishing equipment for rent during the day. We were particularly excited to try out our new teepee tent. The Ozark Trail 7-person Teepee Tent is perhaps the most affordable of the teepee tents available, so we were anxious to try it out for ourselves. 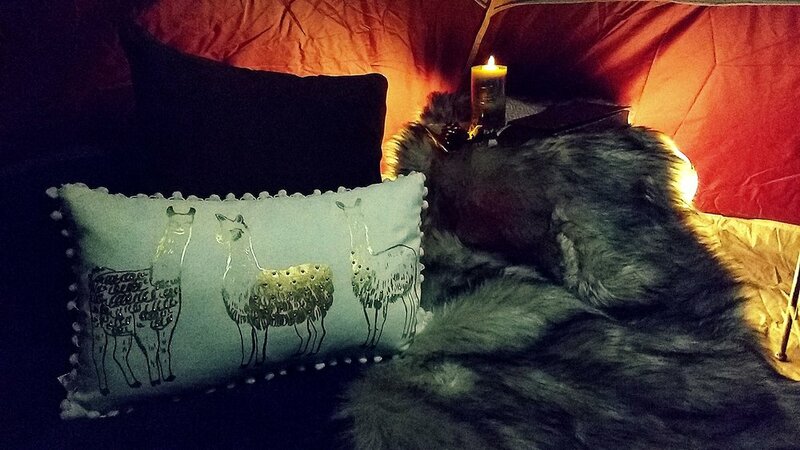 We also had a variety of new decor for our tent and campsite, so we were all set to party in style and comfort! Admittedly, setting up the tent was a bit of a struggle. Unlike most larger tents, it comes with only two legs for support. As one of us balanced it upright, the other had to move around and stake out the sides of the tent to keep it standing. However, once it was up, it was sturdy enough and very cute! The large windows allow for great lighting inside during the day, and help cool you off at night. While the tent could technically sleep seven people, we don't exactly pack light... so this setup could potentially sleep about four people comfortably (with another air mattress). And the height is amazing... camping is an entirely different experience when you don't have to duck to get into your tent! Overall, we would give the tent 4 out of 5 stars. Other than the awkward and counter-intuitive setup, it served us well and is super stylish. 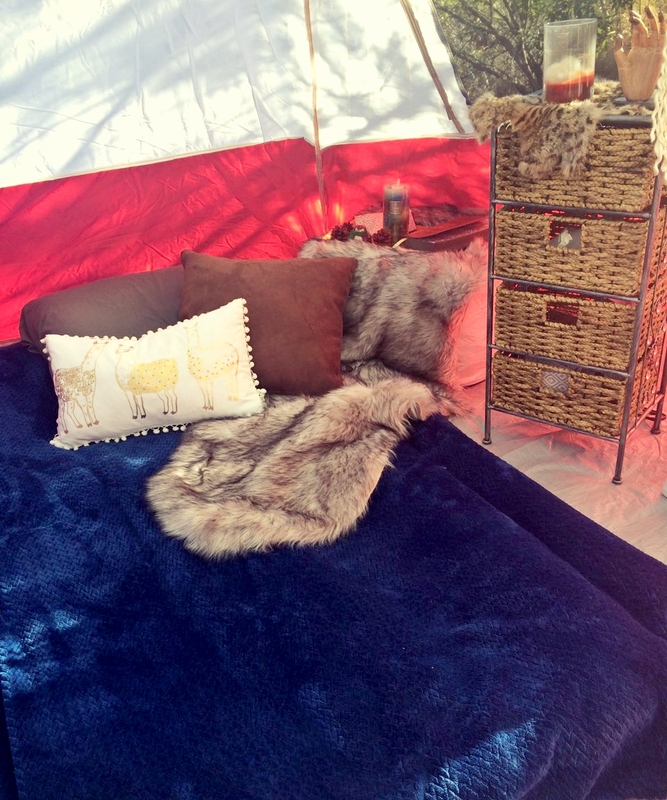 Our tent decor was fairly simple but incredibly comfortable. We actually used this opportunity to try out a new car air mattress. Although it's made to fit conveniently into the back of SUVs and minivans, it also works well for camping! All it needs are some soft blankets and comfy throw pillows, and it feels like you're back in bed at home. Perhaps my favorite accent in the whole setup was the fur throw. Faux fur is my current aesthetic and I thought this throw was to die for! And is that llama throw pillow not adorable? Sophia even pulled out some of her hand-made macrame to decorate with. We picked up a lot of our decor from the clearance sections at TJ Maxx and Target, but of course specific products vary from location to location. You never know what you're going to find there so keep an open mind! If you like what you see and want this decor, I've collected a few Amazon items below that are either similar or the exact same products. Setting up a tent is hard work, so after we finished it was time for lunch. Luckily, we came fully prepared with a melamine dish set and and my favorite set of Keto stainless steel wine glasses. Our first day there was pretty warm; we decided on a refreshing Asian cucumber salad. For this and other delicious, simple camping recipes, check out Glamp-Ed's guide to camping cuisine. After lunch, we still had a few hours of daylight to kill, so we decided on a short hike with the pups. We had Winston and Shaunna with us, and they're always game for an adventure, so we headed to the peak of the tallest hill within walking range of our campsite. Let me tell you... the view was downright stunning. Many of the campsites at Dixon have great views of either the lake or the surrounding city, but with a little more elevation the vista was truly amazing. One of my favorite things about this campground is how secluded it feels when you are actually only minutes (and I mean literally three minutes) from the bustling city of Escondido. It really is a hidden gem. Before we lost the light, we hurried back to the campground and set up all of our lighting equipment. I've said it before and I'll say it again, one of the most important aspects of glamping is the lighting. Without it, you're likely to stumble around in the dark, knocking things over and wasting all of your hard setup work. To learn how to light your campsite properly, and for other great glamping tips, read our camping-to-glamping guide. It was a very dark night, so we illuminated the perimeter of our campsite with solar LED stakes to avoid tripping or stumbling off into the wilderness. We also hung plenty of string lights, battery-powered plastic bulbs, and - of course - my trusty Luci lights, which I never camp without. 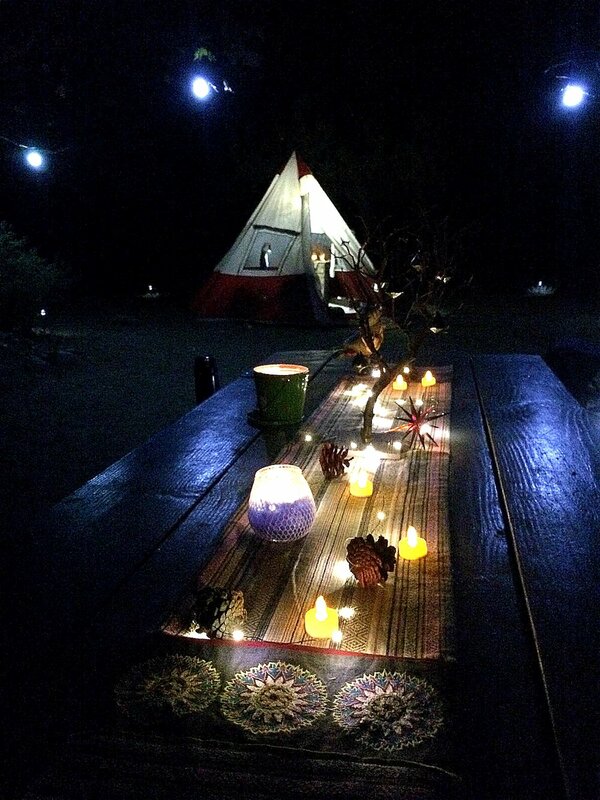 We also scattered some LED tealights on the picnic table and inside the tent, set out some citronella candles to ward off any stubborn bugs that somehow survived the bitter California winter, and hung lanterns inside the tent. To add a little ambiance, we plugged a portable solar charger into our LED inflatable pouf. After a quick dinner, we huddled around the firepit, popped open a bottle of Cabernet, and settled down for a relaxing night. It did get fairly cold, and unfortunately Dixon doesn't allow for wood fires (just coal) due to extreme fire danger. So after a little star-gazing, we retired to the tent to play some card games. The next morning called for fresh espresso, a light breakfast, and more hiking - this time around the base of the lake. Here in San Diego, we are incredibly blessed to have temperate weather most of the year, including winter, so it was the perfect day for basking in the sun. Afterward, we did some light reading back at the site and played with the dogs, who were having an absolute blast listening to the sounds of nature and sniffing out critters (Dixon warns on their website that they are currently suffering from some kind of raccoon infestation, though we saw no proof of that during our stay). That night we rang in the new year with some champagne, gourmet camping cuisine, and some of the most beautiful scenery anyone could ask for. Good company certainly doesn't hurt either! Overall, it was an amazing trip and the perfect way to start out the new year. And just because we were outdoors doesn't mean we didn't enjoy all of the glitz and glam of the holiday. For a short weekend glamping trip, I think we did alright for ourselves! Considering we are fairly new to the world of glamping, this was an interesting experience for us. It was really an opportunity for us to get creative and let our glamp flag fly, and we had a lot of fun picking out decor and designing our comfy campsite. The last day of camping is always the hardest and the saddest. No matter how much time you spend out there, it's never enough. Luckily, the process was made easier with teamwork and a nifty dish-washing station we set up on the picnic table. 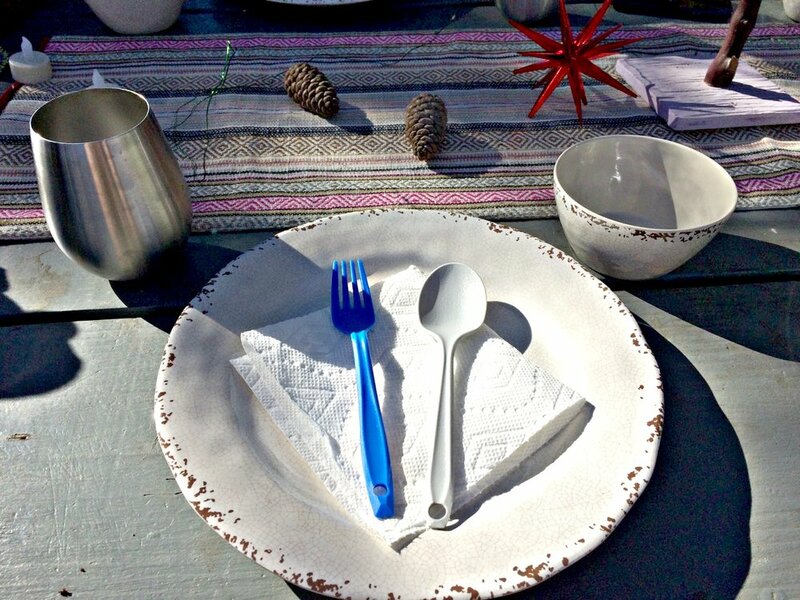 Washing dishes while camping can be a messy job, but this actually made it a breeze. And instead of a traditional sponge, which collects dirt and bacteria especially on a camping trip, we used an item from our very own Glamp-Ed line of products, our TOKKA silicone sponge -- it's practically made for camping. 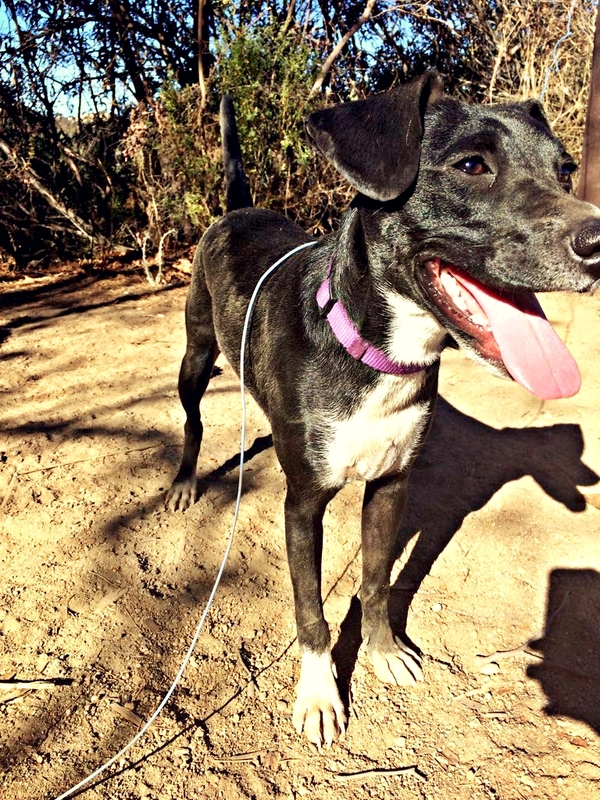 Finally, we packed up the truck, loaded the pups, and bid farewell to Dixon Lake. Not forever though -- especially considering the campsite is only minutes from home! 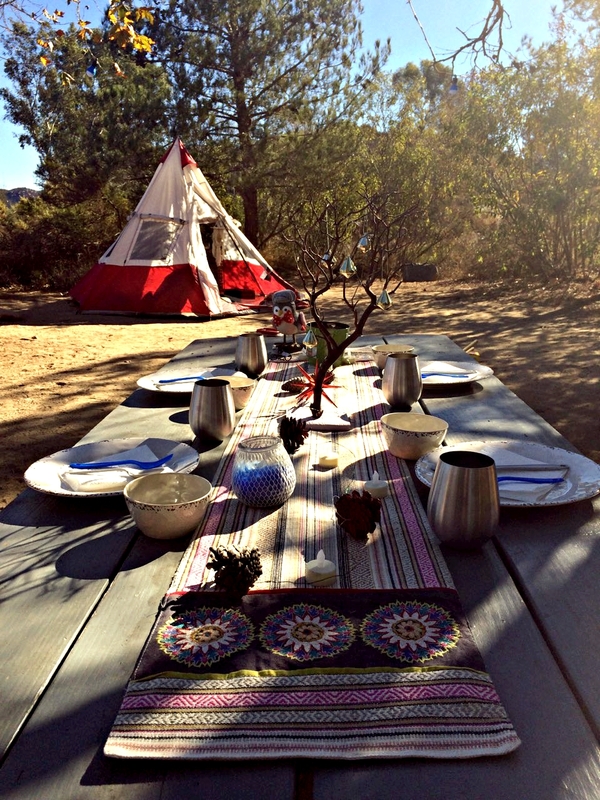 We here at Glamp-Ed are excited to begin a fresh year of new experiences and incredible adventures. We want to thank all of our readers for their continued support and interest, and we can't wait to thrill you with what Glamp-Ed has in store for 2018. Happy New Year and, as always, happy glamping!